Rock band from Detroit, possibly remembered best as the group that recorded Journey to the Center of the Mind, and next to that as the band that served as a step stone for Ted Nugent's career. The band name is equivalent to the title of an Irving Shulman short story, about a Jewish street gang of the same name that was active in the forties in the Brownsville (Brooklyn) area. In a rash moment Ted confessed that he never read the book. We can't help but feel a bit disconcerted. I heard a bit different story. So, my father was a bass player who played in a lot of bands in the Detroit area during the 60's. 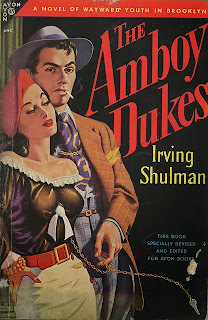 He claimed that the Amboy Dukes was originally his band (not that he was the leader of the band, but that he was in it). He claimed that Ted Nugent actually stole the name from his band when he left Detroit and by the time he came back Ted was a much bigger star than my dad so they pretty much had to give up the name. Unfortunately my father, James Caley, passed away about 10 years ago and his brother Gerald Caley passed a few years before him (I presume Jerry was in the band as well but not sure on this). There is not much I can do now to verify this claim of course. That is unless there is anyone out there who remembers first hand.